I went to pick up my three year old at his daycare center yesterday. He was ramming around outside in the play area with all of his little buddies, as they do every afternoon. As I opened the gate to gain access, one of the teachers approached me. She was holding a clipboard. Oh no, I thought. Who did my kid hit today? Or maybe he had a poopy accident again? What has he done today that will ruin his chances for admission to Yale? As she got closer, I braced myself for the bad news. As I was driving home, my first thought was, that’s cool, at least I know he’ll eat his lunch tomorrow. Sometimes, the food at the daycare center is less than appealing to the picky preschool palette. My middle son attended the same daycare and is scarred to this day from the canned peas they served. But what was I going to do? Opt my son out of McDonalds Day? Reply to the teacher, all holier-than-thou (and hypocritical), “Sorry, we don’t do McDonalds”? Pack him a nutritious lunch of fresh fruit and baby carrots and low-sugar yogurt and a nonprocessed meat sandwich (no peanut butter allowed in our center) on whole grain bread? So he could sit there and watch with envy as all of his little buddies rip into their Happy Meals and open up their pastic-wrapped plastic toys with short-lived joy and excitement? No way! That could scar him as much as the canned peas did my middle son. “Uh, do you mean for the kids, or for me?” I asked meekly. “ALL OF YOU,” she bellowed, as she squinted her eyes and flicked my head again. So, what’s the Inner Perfect Mommy to do? When do you subdue those tendencies and choose the path of least resistance? How far do you lower your expectations for the sake of conformity or convenience? I’m not trying to be perfect, but, like all parents, I want to do what’s best for my kids. I want to hate McDonalds, but I… just… can’t. I don’t. I often say, all things in moderation, and I want to believe that applies to fast food, too. And truly, we don’t eat it all that often… though definitely on roadtrips, and sometimes on busy weeknights. We’re sure not on the Supersize Me diet or anything. My kids are healthy, active, and of normal weight. So, is McDonalds Day at daycare, as a special treat, so bad? I don’t think so, as long as it’s just every great once in a while. But what do you think? I’d love to hear both of all six of my readers’ thoughts on this. Even the lurkers. C’mon, leave a comment. Weigh in (no pun intended). You know you wanna. Posted on July 1, 2008 July 10, 2008 by MegPosted in fast food, lunch, parenthood, UncategorizedTagged drive-thru, fast food, Fast Food Nation, McDonalds, Path of Least Resistance, Perfect Mommy, preschool, Supersize Me. Previous Previous post: Did you think I was kidding? I’ll take a Big Mac extra value meal, with large fries and a diet coke. Ron McD is my friend; it’s OK to have friends in low places. Meg has catalogued my appreciation for good liquor, fine cigars, and high-quality vice in general, but I am by no means a member of the urban haute bourgeois. God Bless America and pass me a sweet ‘n sour packet. It’s all about balance. I’m lucky to have a 3-year-old who may, depending on his mood, eat a bowl of salad, a whole bell pepper or cucumber, or a big bowl of blueberries. So the weekly (pretty much) trips to McD’s don’t worry me too much. Curt and Bets – thanks for the comments. It occurs to me that in the interest of full disclosure, I should probably report that the three year old does sing “Old McDonalds had a farm…” I’m sure he thinks it’s a reference to that restaurant, and, possibly, where the McNuggets come from. “There’s two kinds of chicken. The animal, and the one you eat.” I wasn’t sure quite how to respond!! McDonalds as a treat is cooool. McDonalds as supper when you run out of ideas for supper is coooolll. McDonalds when you’re watching TV late at night and nothing else is open…..McDonalds early saturday morning on the way to the beach….Yum. Please don’t tell me the ending of the book you read about fast food. Ronald is my friend! 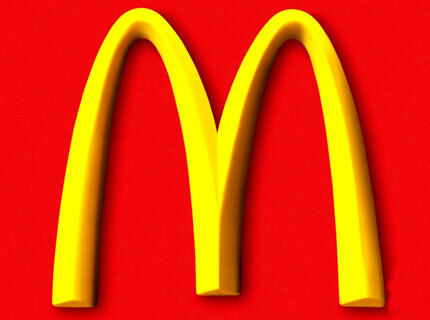 McDonalds is yummy – I had a Big Mac meal just last year and it was brilliant. I just wouldn’t want to pig out on it every day/week/month. And neither do our grandkids when they visit. McD is just fine, no issues at all. The trick is to just not make a big deal out of it…don’t make it out to be a treat. Maybe – just maybe – the boys won’t make a big deal out of it either. So, even though YOU know that the juicy good perfection of a Royale with cheese accompanied with a large helping of tasty fries can be the lunch highlight of an otherwise bland, dreary and unsatisfying lunch week, there’s no reason to let the kids in on it. And Curt…sweet n sour on a Big Mac? That I really have a problem with.